You were brought to the hospital with severe hip joint pain. Doctors after thorough evaluation found that osteoarthritis had damaged your hip joint severely and they advised you to go for a total hip replacement surgery to relieve you from pain and other symptoms. A total hip joint replacement is an operation to remove a severely impaired hip joint and replace it with an artificial joint. The aim of the surgery is to relieve pain and restore function to the joint. Other conditions that can damage the hip joint to the extent that it requires replacement include rheumatoid arthritis (inflammatory arthritis) and hip fractures (particularly in the elderly). Doctors suggested the need for a hip replacement, taking into account your medical history, lifestyle, physical examination and x-rays of the damaged hip(s). You have undergone a hip replacement surgery when you were in the hospital. The surgeon made an incision into the hip, removed the damaged hip joint and then replaced it with an artificial joint that is a metal alloy or, in some cases, ceramic. 1. Non-Surgical treatments that includes pain relieving medications, creams and gels and steroid injections. 2. Hip Resurfacing where less bone is removed than in a hip replacement. Mal alignment of the prosthesis. You may be asked to wear special compression? stockings on your legs for about 6 weeks. These will help prevent blood clots from forming. You may also need to take blood thinners for 2 to 4 weeks to lower your risk of blood clots. Take all your medicines the way your doctor or nurse told you to. Your doctor will tell you when it is okay to start sexual activity again. Don't cross the legs (including the ankles). Avoid forceful or jarring movement of the hip. Avoid twisting movements of the hip. Don't lie on the operated side. Always have a pillow between the legs when lying on the un-operated side. Don't stand for long periods. Sit in a firm chair with arms (to assist getting in and out of the chair. By the time you go home, you should be able to walk with a walker or crutches without needing much help. Most people do not need them after 2 to 4 weeks. Check with your doctor about when to stop using crutches. You should also be able to dress yourself with only a little help and be able to get into and out of your bed or a chair by yourself. You should also be able to use the toilet without much help. You will need to be careful that you do not dislocate your artificial hip, especially in the first few months after surgery. You will need to learn exercises that make your new hip stronger and take special precautions. You will need to have someone with you at home 24 hours a day for 1 to 2 weeks after you leave the hospital or rehab centre. You will need help preparing meals, bathing, moving around the house, and doing other daily activities. Over time, you should be able to return to your former level of activity. You will need to avoid some sports, such as downhill skiing or contact sports like football and soccer. But you should be able to do low impact activities, such as hiking, gardening, swimming, playing tennis, and golfing. Fall or hurt your leg on the side that had surgery. You will need to be careful to not dislocate your new hip when you are walking, sitting, lying down, dressing, taking a bath or shower, and doing other activities. Keep moving and walking once you get home. 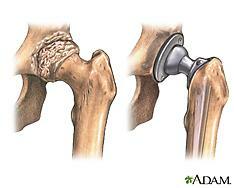 Do not put your full weight on your side with the new hip until your doctor tells you it is okay. Start out with short periods of activity and then gradually increase them. Your doctor or physical therapist will give you exercises to do at home. Use your crutches or walker for as long as you need them. Check with your doctor before you stop using them. After a few days you may be able to do simple household chores. But, do not try to do heavier chores, such as vacuuming or laundry. Remember, you will get tired quickly at first. Wear a small fanny pack or backpack, or attach a basket or strong bag to your walker, so that you can keep small household items, like a phone and notepad with you. A lot of patients who undergo Total Hip Replacement (THR) surgery are relatively old and age can make the recovery time longer. Post-surgery, it may take a long time for complete recovery, therefore arrange for help at home, for driving, shopping and for other chores. Account for a prolonged absence from work. Managing pain is important but indiscriminate usage of over the counter pain killers should be avoided as they can have side effects. Instead adapt alternative techniques such as hot/cold packs, yoga, aromatherapy etc. Weight loss is crucial as obesity can add stress on the operated joint. Work with your surgeon and physiotherapist to pick the correct exercises and gradually advancing them in intensity. Don't smoke and stay away from alcohol. Follow a balanced diet and prudent lifestyle. THR is an involved procedure that may require a longer recovery time. For a long lasting recovery - combine positive dietary and lifestyle changes with the medical care. Post-surgery, the medications can cause nausea. Taking the medicines on a full stomach and incorporating 6-7 small meals/day instead of just 3 heavy meals can help with nausea. 1.Increase Protein, Iron and Vitamin C sources in your diet. 2.Include lots of fresh, seasonal, local and if possible organic Fruits and Vegetables. 3.Add plenty of Whole Grains (whole wheat flour, brown rice, whole beans). 4.Choose foods high in Good Fats (olive oil, peanut oil, fatty fish, walnuts, flaxseeds). 2.Avoid foods high in Bad Fats like cholesterol and trans- fat (egg yolks cream, butter, ghee, coconut, deep-fried items). No whole milk, choose low/skim fat milk. 3.Avoid Hydrogenated Oils such as dalda, vanaspati. 4.No Carbonated, Caffeinated and Alcoholic beverages. 5.If on blood thinners avoids foods high in Vitamin K.
Iron Blood loss during the surgery could cause low iron levels leading to fatigue, anemia etc. Iron supplementation can combat this.